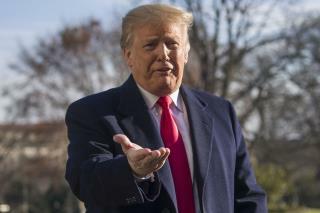 (Newser) – President Trump said Sunday that he can "relate" to the plight of hundreds of thousands of federal workers worried about having to get by without paychecks if the shutdown continues, though critics wondered if the president really had any comparable life experiences. "I'm sure the people that are on the receiving end will make adjustments. They always do," Trump told reporters after returning from Camp David. "People understand what's going on. Many of those people that won't be receiving a paycheck, many of those people agree 100% with what I'm doing." If no deal is reached, Friday will be the first scheduled payday that furloughed federal workers will miss, ABC reports. Trump relates to al the taxpayers who pay the inflated salaries, and some poor performance. Street ppl can relate to no paycheck, don’t know about the rest of working class. "Can relate". Your father gave you an apartment building when you were 10. Dumb has a bag of peckers.